We are proud to announce that we now offer Drone Aerial Mapping & Surveying services in addition to our surveying work. What was once a hobby for many is now being used for real estate, land development mapping, topographic surveys, photo enhanced survey drawings, and for close earth aerial mapping. We can produce topographic surveys, ALTA Aerial Survey images, 3D models, DTM surfaces with photo backdrops, 2D Ortho images, and more. Call us at (423) 702-6505 to discuss your drone surveying project needs. What once cost thousands of dollars to produce through the use of manned aircraft can be replicated for a fraction of the cost with drone aerial surveying. We have used this technology for lots of projects and we’re finding more and more ways to utilize drone surveying for the benefit of our client and to add more value to our surveying maps. Travis Shields is a licensed FAA Part 107 remote pilot. He also possesses an FAA commercial multi-engine rating with instrument privileges and has over 1300 hours in fixed wing aircraft. Our drone is also registered with the FAA as required. We can provide proofs of insurance upon request. Land surveyors have always produced drawings that show the property as if you were looking at it from above the earth. This shows property lines, outline of buildings, fences, encroachments, and distances and directions of the property lines. 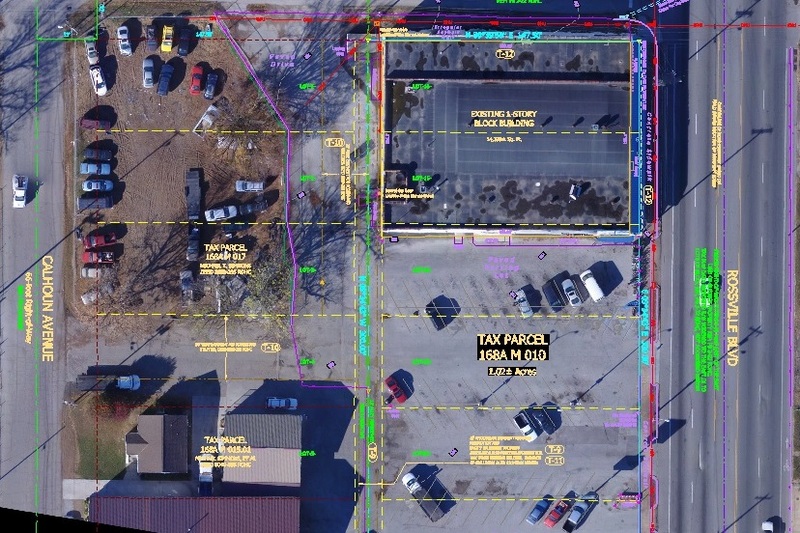 With the addition of aerial images “orthorectified” to the survey drawing we can communicate another “thousand words” to those viewing the drawing. Orthorectified means the lines shown on the map match up with the photo. 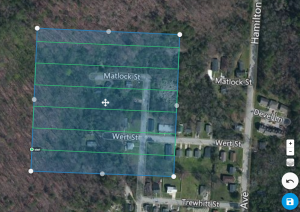 Normally when you look at an aerial map with property lines shown, you’ll notice that the lines don’t match. In fact, sometimes Google will show the tax maps on the map, but NEVER show the aerial images along with that. They just won’t match from the aerial views that they provide. We can produce ortho photos of your property along with the surveying lines and labeling. A surveyor CAN match the precisely run survey with the aerial photography by using aerial control points to “control” the production of the image. This process is called photogrammetry, the science of making measurements from photographs. Photogrammetry has been practiced since the mid-1800’s. Leonardo da Vinci developed the concepts that were used for obtaining perspective and projective geometry. The first aerial photography was captured using kites and balloons. The first photography to be used for aerial mapping was captured in 1908, only 5 short years after the invention of the Airplane by the Wright brothers. Using aerial surveying can be a real time saver for a lot of surveying jobs and it enables us to get a very complete set of data, something that a survey crew in the field would have a hard time doing in a timely fashion. Safety is another of the benefits of aerial surveying using drones. Instead of sending our surveyors into a busy street or a situation with steep grades or equipment that could potentially be hazardous we are able to avoid this by remotely collecting this data with the drone. Using Drones became an option for our business when we realized we needed both faster turnaround times and more detailed modeling of site topography for many projects. 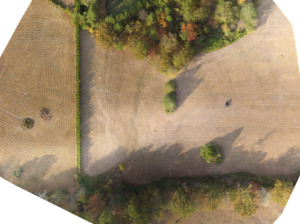 Drone aerial mapping offers quicker, more complete mapping than ground survey methods in many cases, so that problem areas can be identified and addressed. Of course, tree cover is still a problem during the leafy season but winter time is a good time to pick up these images. It is also possible for us to generate our own current, high-resolution aerial imagery for areas where none is available. We are also able to use the drones to produce quality 3d surface models (DTM surfaces) with very dense point sampling. Doing this before drones required a plane or helicopter to fly over the site. This was a VERY expensive task. Now with the drone we have the images back in the office to do the mapping work in less than a day and with significant cost savings. We can deliver the final aerial survey drawing product in picture formats (TIFF, PNG, JPG, etc,) and the normal surveying industry formats of DWG, DXF, and LAS files. Let us put our drone aerial mapping and drone surveying knowledge, skill, and experience to work for you! Call us at (423) 702-6505 today.